Welcome to Health@Work's newsletter for worksite wellness coordinators who work in organizations located in Hennepin County. The purpose of Health@Work's monthly E-tips is to help you (the wellness coordinator) promote better health at your workplace. Please note that any reference to products or services in this newsletter is for educational purposes and does not constitute an endorsement on the part of Hennepin County Health@Work. Have you heard of Zappos or its CEO Tony Hsieh, author of Delivering Happiness? 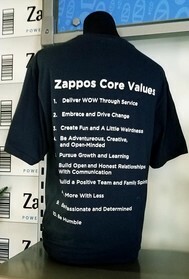 Did you know Zappos shares their core values-based culture in campus tours? The next time you’re in Las Vegas, consider touring this e-commerce business. Although unusual, Zappos illustrates how leaders set the organizational tone and the level of resources dedicated to employee health. As CEO, Hsieh supports wellness by doing (leading by example), speaking (wellness conversations), and creating (systems and processes). These are the practices thought leader Laura Putnam encourages middle managers to adopt in this 4-minute WellRight YouTube video about increasing employee engagement. Looking more broadly, an International Foundation of Employee Benefit Plans survey found leadership involvement present in 57 percent of workplaces that have wellness programs that positively affect health care costs. In these workplaces, 54 percent have senior leadership who, like Hsieh, speak directly with employees about wellness. Research suggests that when employees perceive greater leadership support for wellness, they are more likely to participate in wellness activities, report lower job stress, and engage in healthy activities. Wondering how to maintain or increase leadership support for wellness in your workplace? Capture your baseline. On the fourth page of the Wellness Culture Coaching Toolkit by HealthyCulture.com there is an assessment of leader support for healthy lifestyles. Further, consider applying for Health@Work’s Wellness by Design recognition award to benchmark your efforts. Make a plan. Consider these 10 tips from WebMD to better engage your workplace’s leaders in promoting employee health. Encourage leaders to signal psychological safety. Have you heard the recent media buzz about psychological safety at work? Leaders, including yourself, can contribute either to a culture of fear or to one of safety. In the latter, employees feel safe to do their best work. Read this interview of Amy Edmondson, author of The Fearless Organization, to learn more. Another engaging book is The Culture Code by Daniel Coyle. Foster high career well-being. Health@Work has a career well-being toolkit that addresses organizational culture and cultivating leadership buy-in. Contact Linda Brandt to learn more. Click here to read this month's E-tips for your employees titled "Become a leader at work." Email the E-tips document to your staff as an attachment. 1) Click the link to download and save the E-tips to your computer. 2) Add your organization's logo in the bottom left corner. 3) Then send it as an email attachment to staff. Print the document once you've added your organization's logo and post it in a common area in your workplace. Copy and paste the text into your organization's newsletter. Hennepin County Public Health Health@Work offers a broad range of low- and no-cost workplace wellness programs and services to employers located in Hennepin County. For more information visit the Health@Work website.